quote. "sometimes life its you in the head with a brick. don't lose your faith"
Steve jobs in most know for the iPhone. Steve is on of the most reneged people in the tech world. Steve jobs rival is bill gate but they also are best friends. he made on of the most used thing to day the smart phone. the smart phone revolutionized technology. bill gates set examples of where we can go and where the world can go. 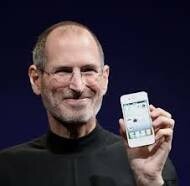 Steve job had many failure but he never gave up and that's what makes him the man he is to day.